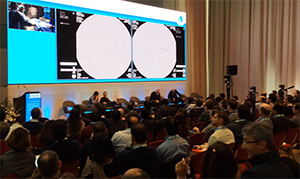 ALICE – Advanced Live Interventional Course of Essen - will be back soon again in Essen from the 12th to the 14th of March 2018. We found several new important developments in the treatment of arteriovenous malformations and will expose in a special video session the interest of staged venous embolizations and also the technique of transnidal catheterization to get an antegrade arterial access to retrograde arterial feeders fed in by collaterals. To further promote transvenous access in AVMs, we will not only transmit from our cathlabs in Essen but also from Limoges in France with the participation of Charbel Mounayer. Our special session "ALICE in trouble" will focus on complications with potential ways on how to avoid or resolve it. Our new session „Perspectives in the Neuroendovascular Field“ will be conducted by Mayank Goyal. We intend to take benefit from the exceptional concentration of experienced physicians attending ALICE to decide which further studies to be planned and draw their lines together. We will keep you updated on all treated cases during previous editions of ALICE. We expect again interesting and passionate discussions between all participants with the support of our experienced moderators. Recent changes in regulations led us also to offer a grant to physicians wishing to participate to the course so that the charges for venue and registration will be covered. The number of available grants is limited, we will inform each applicant within the month following registration if the grant is possible. The maximum capacity of the auditorium is of 400 participants, this size should enable discussions to be going on. I apologize to all that cannot registrate. We will keep our location at the Philharmonic Hall of Essen which allows to keep the special atmosphere that we enjoyed in the past editions of ALICE favorable to fruitful discussions and strong interaction with all participants. This location offers an increased comfort and is close enough to the hospital for us to be able to rapidly join the auditorium after the live cases. Online registrations will start with opening of the website. Penumbra, Inc., headquartered in Alameda, California, is a global healthcare company focused on interventional therapies. We design, develop, manufacture and market innovative devices. We have a broad portfolio of products that address challenging medical conditions and significant clinical needs across two major markets, neuro and peripheral vascular. The conditions that our products address include, among others, ischemic stroke, hemorrhagic stroke and various peripheral vascular conditions that can be treated through thrombectomy and embolization procedures. As a global leader in medical technology, services and solutions, Medtronic improves thehealth and lives of millions of people each year. We believe our deep clinical, therapeuticand economic expertise can help address the complex challenges — such as rising costs,aging populations and the burden of chronic disease — faced by families and healthcaresystems today. But no one can do it alone. That’s why we’re committed to partnering innew ways and developing powerful solutions that deliver better patient outcomes. Founded in 1949 as a medical repair company, we’re now among the world’s largestmedical technology, services and solutions companies, employing more than 85,000people worldwide, serving physicians, hospitals and patients in nearly 155+ countries.Join us in our commitment to take healthcare Further, Together. We Kaneka is a Japanese medical device manufacturer and found in 1949, over 67 years ago in Japan. We have been engaged in the manufacture and sales of chemical based products. At Kaneka, we are infusing dreams into science to make real things that have never existed before, and we are creating a variety of new products and technologies that support the lives of people. We are a company that realizes dreams through science. Since its founding in 2005, phenox has been dedicated to developing innovative, breakthrough and clinically proven technologies and solutions for the treatment of neurovascular diseases. phenox's products are used by endovascular specialists to treat ischemic and hemorrhagic stroke. The product range includes the pRESET Thrombectomy Device, the p64 Flow Modulation Device, the pCONUS Bifurcation Aneurysm lmplant and the pITA RX Neurovascular PTA Balloon Catheter and the pORTAL Guidewire. We are pleased to inform you that the congress is COMPLIANT with MedTech Europe Code of Ethical Business Practice. Rapid Medical is a company focused on the development of neurovascular interventional devices. It is the maker of Tigertriever – a one-of-a-kind, fully-visible, controllable stentriever that is adjusted to perfectly fit the dimensions of the intracranial vessel, and of Comaneci - the first-ever controllable aneurysm neck bridging device. CERENOVUS has a bold vision to change the trajectory of stroke. Our promise to our customers is to continue pushing the boundaries of what’s possible in stroke care, so that stroke is no longer a life sentence for patients. Asahi Intecc develops and supplies high-quality medical products using an integrated in-house production system that covers everything from the selection and treatment of raw materials to the manufacturing of final products. For the field of neurology we have developed the CHIKAI series of guide wires, which all feature the ACT ONE composite core technology that ensures one-to-one torque transmission for optimal control. We also offer the guiding catheter FUBUKI, available in 4.2Fr, 6Fr, 7Fr, and 8Fr sizes. FUBUKI combines safety and back-up, two characteristics that are traditionally considered to be a trade-off. Safety is provided by the soft distal shaft and the radiopaque soft material used for the tip that is rounded on both sides. The reinforced proximal part of the shaft on the other hand generates back-up. Asahi Intecc is also active in the peripheral field, the PCI field and the abdominal field. Acandis GmbH & Co. KG is a German, owner-managed medical devices company based in Pforzheim – the gateway to the Black Forest. MicroVention provides a complete 360-degree approach to developing neuroendovascular technologies for aneurysms, ischemic stroke, carotid artery disease, and neurovascular malformations worldwide. Additionally, our access product line is designed to be multi-compatible and customizable across each disease state to allow our customers to uniquely address the needs of their patients’. Where and how to place stents? Are Flow Diverters to be considered in distal bifurcation aneurysms? Which place for Web and Medina coils? Comaneci, an alternative to balloons? Onyx, Squid, Phil or Glue? Double lumen balloons for intracranial stenosis Which stents to be used? Does Aspiration really makes sense? When to go on for double stentretriever maneuver? Is IV lysis still needed?